Despite the extreme cold temperature warning in the city, a couple of urban sketchers left their warm cozy home to go sketch people in the subway. 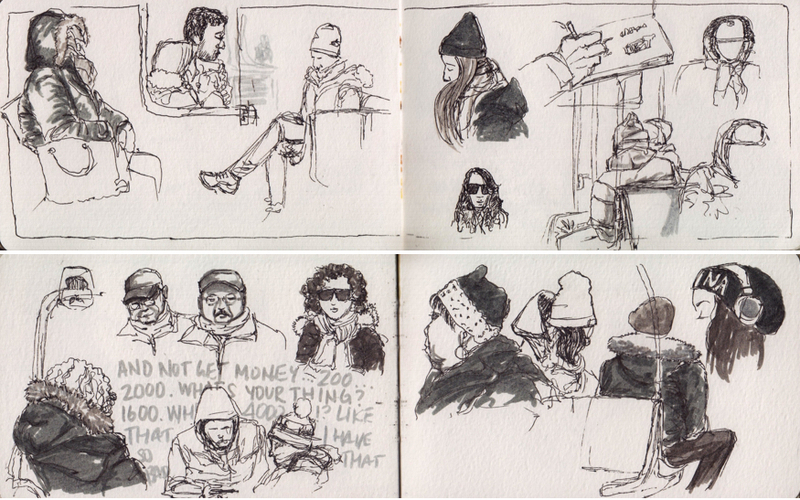 We had a great turnout and a lot of great sketches of people riding the subway on a frigid Sunday afternoon. Torontonians don't usually get temperatures below -20 degrees C, so it was interesting to capture the various ways they bundled up to protect themselves from the cold. Tuques, caps, hooddies, puffy jackets and lots of layers were popular today. An interesting fact that we discussed while observing passengers, is that most people wear black or grey coats. There's not a lot of bright colours for outerwears in the city other than the occasional red Canada Goose Jackets. Above are the sketches I did. I was able to capture some conversation going between two teens about a game. They seemed so serious about it. By the look on people's face, I would say that most have had enough of winter and are looking forward to spring weather. Hopefully soon we'll start seeing temperatures above zero. Check out the Toronto Urban Sketchers' blog for a sneak peak at the others sketcher's sketchbook.